Issue: 2 / Year: 1951. Matt Baker story and cover art. Large/heavy items cost more than the standard rate to combine. Priority, Express or other services are extra-please let us know and we will revise your invoice. This amount cannot be adjusted. This includes CGC, PGX and CBCS graded comic books. Please be aware these items are NON RETURNABLE. I can sell items for you! 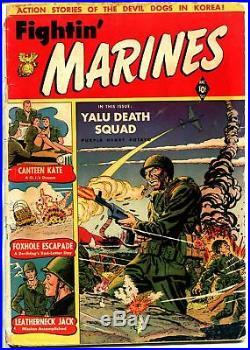 The item "Fightin' Marines #2 1951-St John-1st Canteen Kate-Matt Baker-Korean War-G" is in sale since Sunday, May 13, 2018. 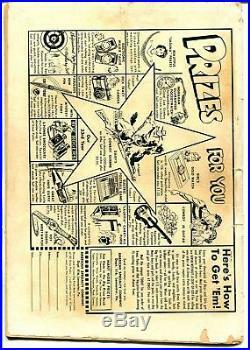 This item is in the category "Collectibles\Comics\Golden Age (1938-55)\War". The seller is "dtacoll" and is located in Tampa, Florida. This item can be shipped to United States, Canada, United Kingdom, Denmark, Romania, Slovakia, Bulgaria, Czech republic, Finland, Hungary, Latvia, Lithuania, Malta, Estonia, Australia, Greece, Portugal, Cyprus, Slovenia, Japan, China, Sweden, South Korea, Indonesia, Taiwan, South africa, Thailand, Belgium, France, Hong Kong, Ireland, Netherlands, Poland, Spain, Italy, Germany, Austria, Bahamas, Israel, Mexico, New Zealand, Philippines, Singapore, Switzerland, Norway, Saudi arabia, Ukraine, United arab emirates, Qatar, Kuwait, Bahrain, Croatia, Malaysia, Brazil, Chile, Colombia, Costa rica, Panama, Trinidad and tobago, Guatemala, El salvador, Honduras, Jamaica, Viet nam, Uruguay.